above do not incorporate a socket. cause the circuit foils to tear. grounded or isolated soldering tip, avoid touching the pins of IC chips with your fingers, and ground yourself with a wrist ground strap. 2. Remove both the top and bottom covers from the transceiver. 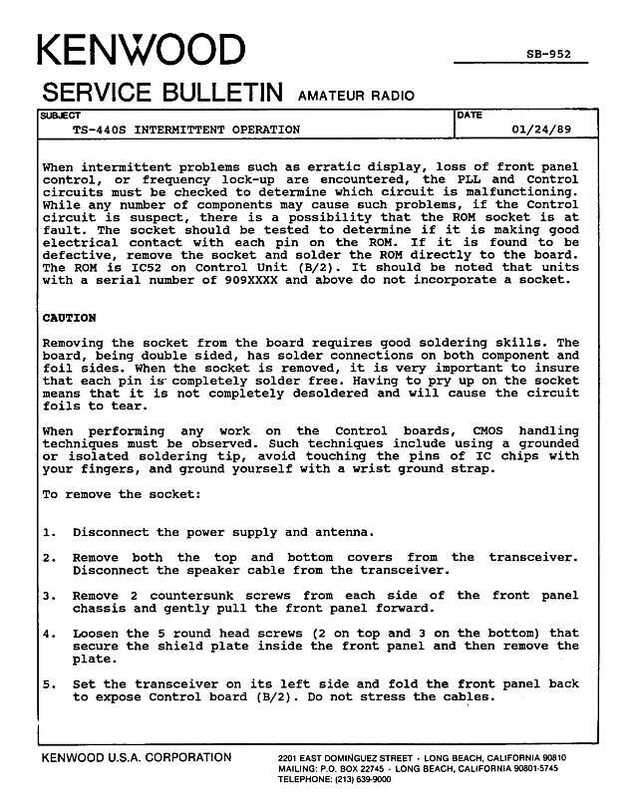 Disconnect the speaker cable from the transceiver. 3. Remove 2 countersunk screws from each side of the front panel chassis and gently pull the front panel forward. 5. Set the transceiver on its left side and fold the front panel back to expose Control board (B/2). Do not stress the cables. 6. While avoiding contact with the pins, remove the ROM (IC52) and set it aside on anti-static foam. 7. Unplug connectors 56 - 58 from Control board (B/2). remove the brass screw from the Control board (A/2) so the angle bracket stays with the top board. board. Pull both boards forward and open them like a book to allow the best access to the foil side of Control board (B/2). the top foils are still soldered to the socket. 11. Install the ROM in the board and solder it in place. board during installation. If the harness produces excessive stress on the board, solder connections may become intermittent. This modification may be covered under warranty during the warranty period. Time required for this modification is 1.5 hour or less.